Dermal Therapy™ Dry Skin Lotion is formulated with the latest innovations in natural emollients, it is suitable for dry, sensitive, rough, itchy or flaking skin. Dermal Therapy Dry Skin Lotion is formulated with naturally derived ingredients designed to deeply nourish and hydrate the skin. Ideal as an everyday moisturiser for dry, sensitive, rough, itchy or flaking skin as well as skin prone to eczema, psoriasis and dermatitis. Gently massage Dermal Therapy Dry Skin Lotion into the skin as needed. For best results, use in conjunction with Dermal Therapy Soap Free Wash.
Over a 2 week period, subjects between the ages of 24 to 61 tested Dry Skin Lotion on a site area of their skin to determine if there would be an improvement in skin hydration. Results showed that on all site areas of each subject tested there was an increase of skin hydration compared to the untreated skin. After two weeks the Dry Skin Lotion had increased skin hydration on the site areas of up to 50%. 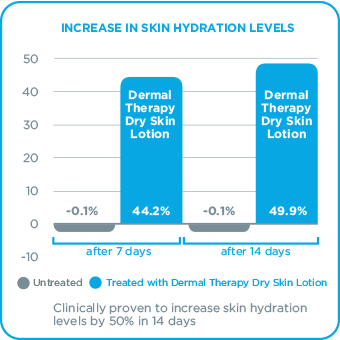 The above results are from a study conducted by Derma Consult Concept GmbH Von-Weichs-Str 9A 53121 Bonn, an independent testing facility as commissioned by Lacorium Health Australia Pty Ltd.
Over a 24 hour period, subjects between the ages of 24 to 61 tested Dry Skin Lotion on a site area of their skin to determine if there was an increase of hydration in the skin. 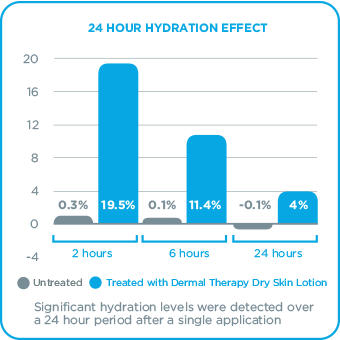 Results showed that on all site areas of each subject tested there was a significant increase of skin hydration after a 24 hour period.